“When you can’t find things, you can feel frustrated, angry, and unproductive”, says Kelli Ellis, an Orange County, Calif. When I found this article on WebMD, I kept shaking my head in agreement as I was reading because it is so true. You cannot find things when they are not organized and your most certainly cannot find things if they are sitting amongst pounds and pounds of stuff/clutter. That is why I am so in love with the 100 Clutter Club Challenge ( formerly on Monday’s). I keep those 10 minutes of clutter busting clear every single week come rain or come shine. I am astounded the difference such a little time and effort make in the every raging battle of clutter in a busy family’s life. SO HERE WE GO TEAM! 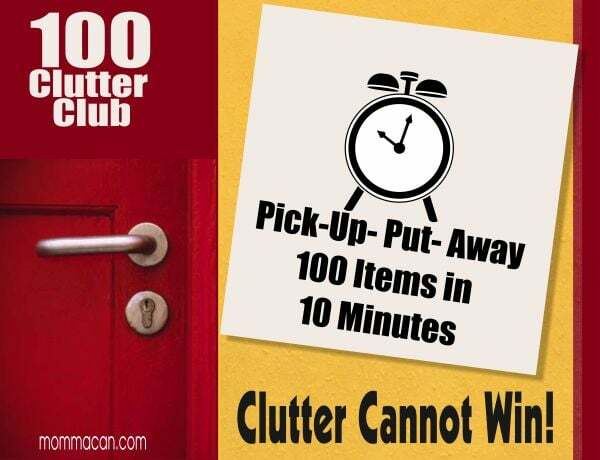 This is the Clutter Club Challenge – Which means we are paying our 100 club dues. So grab that trash bag and clutter box and turn on some music. Put away, donate or trash 100 items and if your children are home today have them jump in and put away as many toys as they can during perhaps one song on a CD. Just tell them that Legos and Barbie Shoes count and they will probably beat you to the finish line! The 100 club is not just for moms, it’s for the whole family!